Surrey Police is assisting Surrey Fire and Rescue Service in investigating a fatal fire in a house in Holywell Way, Stanwell. Emergency crews were called just before midday today (14 April) and, on arrival, the property was already well alight. The fire caused substantial damage to the house, along with some damage to the neighbouring properties, which made searching the upstairs of the property difficult. Sadly, when Surrey Fire and Rescue officers were able to access the upper floor of the house a body was found. The next of kin have been informed. The cause of the fire is unexplained, and officers will remain on scene until at least tomorrow when it is hoped the building can be made safe enough for further investigation to take place. We are aware that individuals locally were filming the fire and the actions of the emergency services. We would ask that the public consider the feeling of those who knew the deceased before sharing footage on social media. 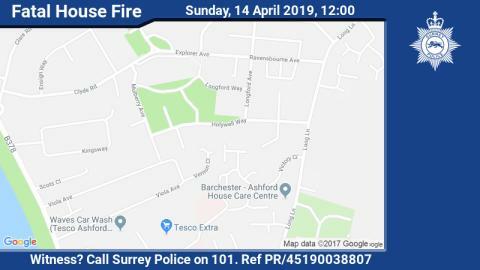 We would also ask anyone who has footage taken before the emergency services arrived to contact Surrey Police on 101 (or www.surrey.police.uk/tellusmore), quoting reference PR/45190038807, as your footage could help with our investigation into the cause of the fire.